Feature photo – retirement presentation: from the left – CWO Rob Keating; Chris Thibault; and CWO Garth Hoegi. Caption: Colonel C.C. 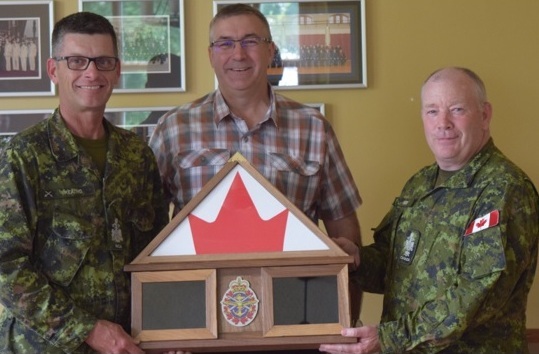 Ayotte, Director of Cadets making one of the many presentations to Chris Thibault on the occasion of his retirement following over 36 years of service with the Canadian Military. On Friday, June 1st, RMC staff members and family alike gathered together to celebrate the retirement of Major C.J. (Chris) Thibault MMM, CD. Chris joined the Canadian Armed Forces on 3 Nov 1982 as an Administration Clerk. His first posting was to Edmonton where he met his wife of 30 years, Rene. There he served with 440 Transport and Rescue Squadron, Canadian Forces Base (CFB) Edmonton, and Canadian Forces School of Traffic and Movement. His adventures in Alberta continued in Calgary where both his children were born. He first served at CFB Calgary, and then Lord Strahcona’s Horse (Royal Canadians). During that period Chris deployed to Croatia with 1 Combat Engineer Regiment as well as to Bosnia with the Strathcona Battle Group. Hoping to move back to Edmonton with the regiment, his career manager had other ideas, and it was off to Kingston; he served at Canadian Forces School of Communications & Electronics, then CFB Kingston, and finally as the Fort Sergeant-Major (SM) & Head Quarters SM at the Canadian Land Force Command & Staff College and Land Force Doctrine and Training System. Upon promotion to Chief Warrant Officer (CWO) in 2002, Chris moved his family back to Alberta, this time at 4 Wing Cold Lake as Admin Branch CWO. Having stayed away from Ottawa for 24 years, the laws of average finally prevailed and in 2006 Chris became Directorate of Human Rights and Diversity CWO at National Defence Headquarters (NDHQ). 22 months later he assumed the position of Canadian Forces Support and Training Group CWO and Base CWO at CFB Borden. 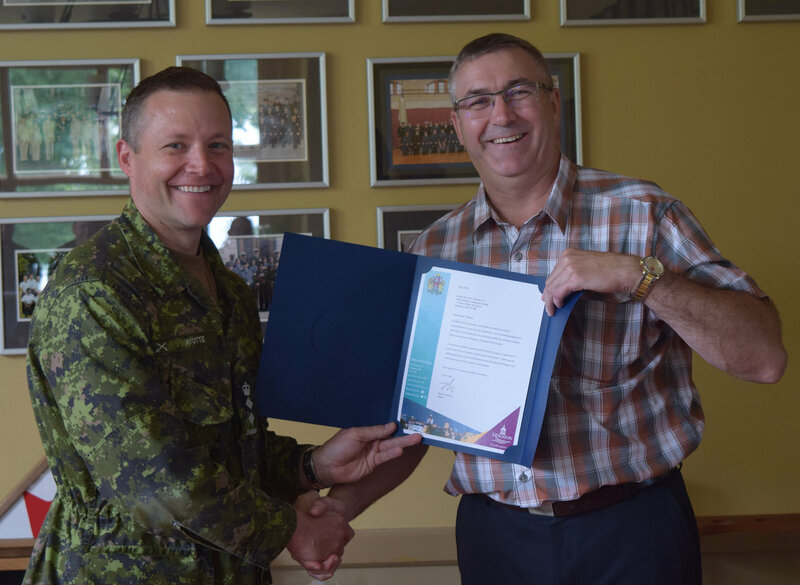 After 29 years of service, Chris went back to school, attending the NCM Executive Professional Development Programme at Royal Military College. In 2012, he was posted to Canadian Defence Academy (CDA) as the Formation CWO. July 2015, he assumed the role of Command CWO at Military Personnel Command (CMP) in Ottawa. Two years later, he was commissioned to his present rank and took on the role of special advisor to the Director of Cadets at RMC – assisting in the implementation of the Special Staff Assistance Visit recommendations. It is evident he had an impact wherever he went as many came to the front to speak about their experiences working with him. Chris has had a long and fulfilling career in the military and now hopes that his golf game will finally improve.